With the Uber Visa Card, you can earn rewards for all your purchases—and those rewards stack up even faster for things like grabbing dinner with a friend, booking your next trip, taking an Uber to work, or even shopping online. You can redeem your rewards for Uber credits (that you can use on both rides and UberEATS), cash back, and a wide variety of gift cards. 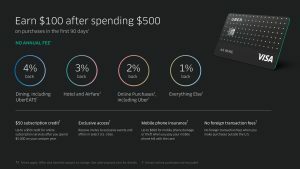 It gets even better with the card’s additional benefits, like the annual $50 subscription credit that can be used on services like Spotify, Netflix, or an Amazon Prime membership*. Cardholders will also get coverage for mobile phone theft or damage and receive invites to exclusive events like secret shows and dining experiences*. The Uber Visa Card is available nationwide beginning November 2, 2017. You can find out more at ubervisacard.com. * Benefits are subject to terms, see ubervisacard.com for details.